We are building on our list of places to shop in Oxfordshire, are there any hidden gems you know about that should not be missed?! Let us know! Oxford Lighting is a quirky Lighting Showroom based near Culham, Abingdon. It’s situated on an old RAF base and from the outside looks pretty dull, but do not be fooled, for when you open the door you are greeted by 100’s of lights, over 300 of them! You will find Outside lighting, kitchen lighting, Oxfordroom lighting, table lamps, floor lamps, spotlights, track lighting, Tiffany lighting, pendants, chandeliers, wall lights, children’s lighting, and more! If you can’t find what you are looking for on display, you can get help from one of the family members (it’s a family business!) to find what you are looking for amongst the 20,000+ products available to Oxford Lighting in the huge array of catalogue’s. The owner of Oxford Lighting has a wealth of experience in both Lighting & Electrical services and is always happy to help make sure you get the right lighting for your requirements. They also provide consultancy services, installation, and commercial design. Get yourself to the Showroom this Bank Holiday Monday and get a huge 25% off all Endon Lighting products! Oxford Covered Market can be found in the City Centre. You will find Oxford’s best local crafts, food, and drink with over 40 traders selling gifts, shoes, fashion, flowers, jewellery and more. many of the businesses in the Covered Market are independent with some having been passed on from generation to generation. Bonners Fruit and Veg is a family run business that was established in 1926! Great customer service and first class products mean this should not be missed, whether you live in Oxford or are visiting, the Covered Market is a must. The Covered Market is open to the public from 8 am – 5.30 pm Monday to Saturday and 10 am – 4 pm on Sundays. However, all the businesses have their own opening times and some do not open on Sundays so please check ‘Our shops’ where you will be able to access individual businesses websites and telephone numbers. One of the most famous little shops in the world can be found in Oxford just across the road from Christ Church College. 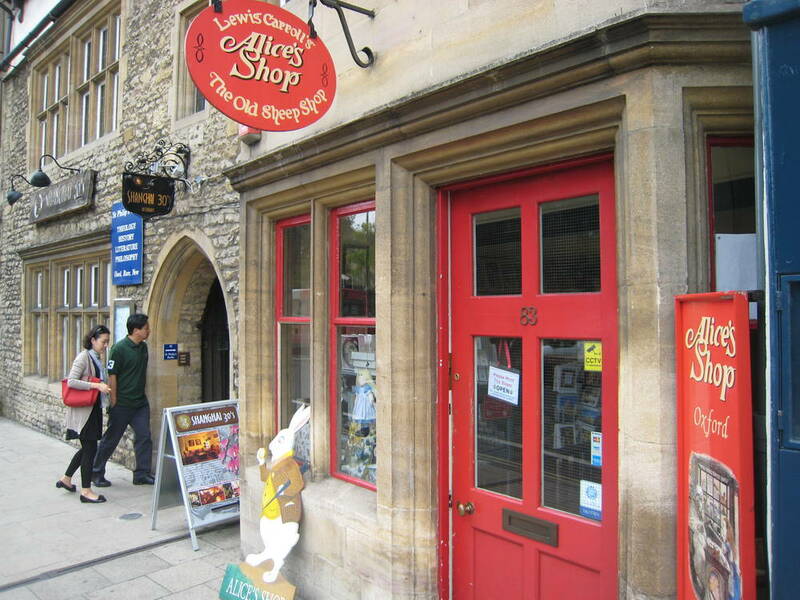 The Alice’s Shop in Oxford is world famous because the shop itself was written into the Alice adventures over 150 years ago. As soon as the stories of Alice’s adventures became well known, the shop was locally called ‘Alice’s Shop‘ even as it traded as a grocery shop. The shop began to sell Alice in Wonderland souvenirs in the 60’s and is now a ‘treasure trove’ of Alice themed souvenirs, gift’s and memorabilia. To advertise your business on What’s On In Oxford – Call Laura on 01865 407360 or email hello@whatsoninoxford.net – Great rates available!